The Indian startup ecosystem celebrated the arrival of its tenth unicorn in August 2016 with Hike crossing the $1-billion mark in valuation, following the $175-million funding from Tencent and Foxconn. It has been 10 months since then, but India has not seen any other newbie joining the coveted list. However, elsewhere, Indian techpreneurs continued to weave a story around stuff legends are made of, giving birth to at least three unicorns in the past six weeks. Rubrik, a one-stop-shop for business data, is one among them. 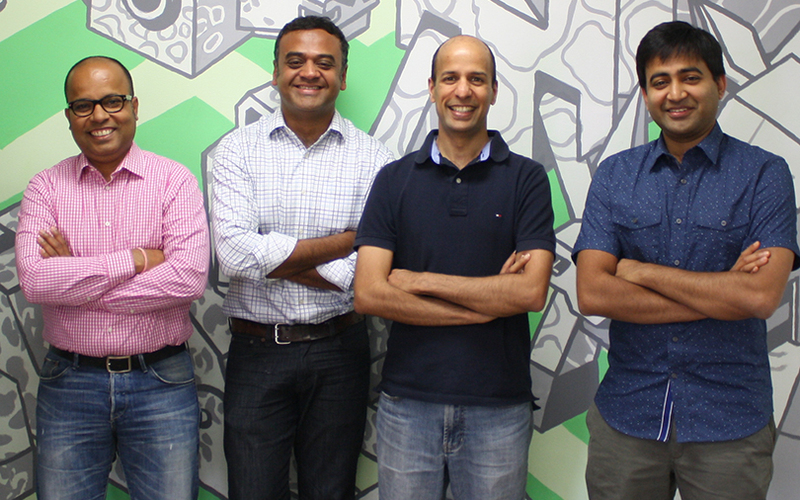 The startup from Silicon Valley founded by Bipul Sinha, Arvind Nithrakashyap, Arvind Jain and Soham Mazumdar in 2015, became a $1.3 billion company after a $180-million round led by Institutional Venture Partners in April. What’s more, the company did not even have to dip into the $60 million it had raised in a series C round. Rubrik is the story of yet another new generation hyper-growth startup that attracted investors by the hordes. “We have grown our employees by more than 15-times in the past two years (to 250) and have expanded to five continents in five quarters. We approached $100 million in bookings in just six quarters of selling,” Bipul Sinha, the founder CEO, had said in a blog post back then. When we met him in Bangalore last week, the employee count had further increased to 400. But, what did Rubrik do to attract several hundred customers, including Fortune 500 companies and governments, besides top engineering and sales talent and hotshot investors? “Rubrik is the google for business data. Google allows you to get publically-available data fast. Rubrik allows business users to get business data fast,” says Sinha. After graduating from IIT Kharagpur in the mid-1990s, Sinha moved to the US as an engineer with Oracle. He went on to lead several patent-winning tech products for the IT major before joining Wharton for an MBA degree. Soon enough, a team of adventure-seeking techies teamed up to make the opportunity count. While Rubrik CTO Nithrakashyap, or Nitro, was Sinha’s colleague at Oracle, Jain, the vice-president, engineering, and Mazumdar, were former Google executives. “In the first 18 months, we built the first version of the product. Once we understood there was a very strong product market fit we decided to double down on our effort to capture that market,” Sinha said. The rise of Rubrik, along with that of several others, saw the emergence of the ‘unicorn Indians’ club in the Bay Area. In fact, just about 40 days after Rubrik’s fundraising, another Indian-led enterprise, Netskope, raised a $100-million round to claim its place among the $1-billion-plus companies last week. Earlier this year, AppDynamics, founded by Jyoti Bansal, was bought over by Cisco for $3.7 billion, while last November, cloud-computing firm Nutanix founded by Dheeraj Pandey went public to touch a market cap of $5 billion. Interestingly, Sinha was the first investor in Nutanix, and was its longest-serving board member. He, however, rejects the idea of an ‘India club’ and does not read too much into the rise of Indian-led tech companies in the US. Sinha was in Bangalore to open a product and engineering centre. In March, Rubrik had roped in former Flipkart vice-president, engineering, Ashish Gupta, as its centre head. The two had met at Tata IBM two decades ago as freshers.